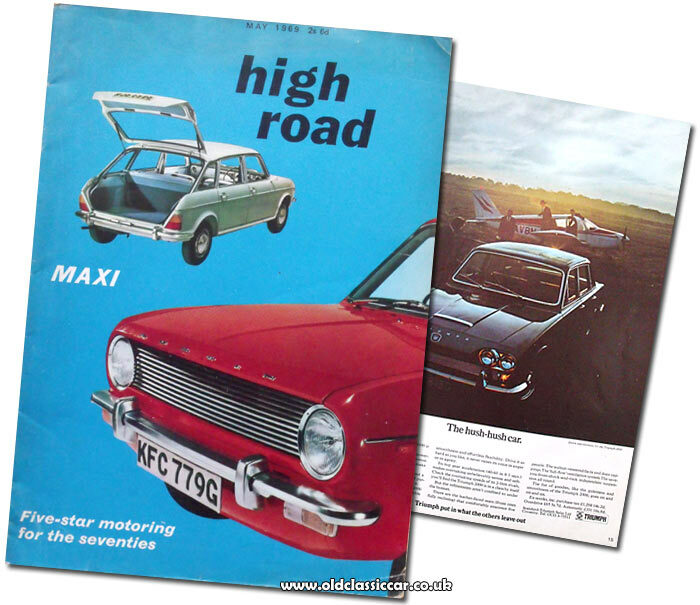 BLMC (British Leyland Motor Corporation Ltd) "High Road" magazine. Homepage. This page: Austin, Morris, Triumph et al now all feature together in a BLMC corporate magazine. High Road magazine, May 1969. May 1969, and excitement rippled through the corridors of the might BLMC empire as the new Austin Maxi (ADO14) was readied for its public. In April the car had made its debut in Portugal, the first new car to be marketed by the recently-formed British Leyland Motor Corporation (later just British Leyland - BL), a sprawling organisation that drew together many British car and lorry manufacturers under one umbrella, BMC marques in the main, in a bid to rejuvenate the individual companies therein. Cars from rival factions within BLMC often fought over the same buyers in the marketplace, for instance Rover 2000 vs Triumph 2000, Triumph Spitfire vs MG Midget, MGC GT vs Triumph GT6, as just three examples of the duplication that existed following the creation of BLMC, and in some cases continued for many years thereafter. High Road magazine pulled together articles that previously would have featured in separate factory-produced magazines. In the 1960s, these included titles such as AUSTIN Magazine, News Exchange (Nuffield Group products), and the Standard-Triumph Review, although there were many more, even just in the Austin/Morris arena alone. In its own small way, High Road, a single title designed to replace the many that had gone before, was a glimmer of hope that unnecessary duplication and confusing line-ups within the organisation would soon be a thing of the past (it wasn't to be). The rather plain cover features BLMC's great new hope - the Austin Maxi. 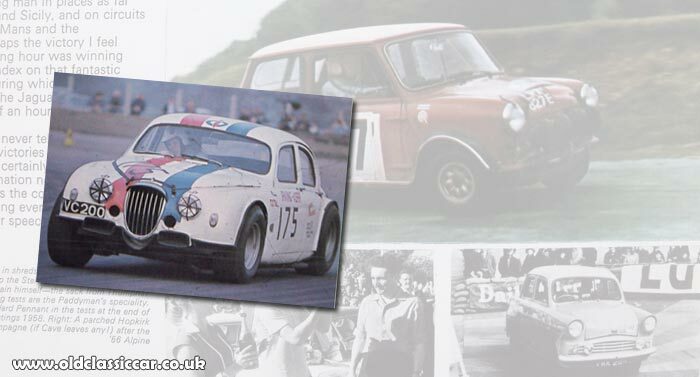 Originally it was planned for the car to simply be called the Austin 1500 (with a Morris variant due later). However Chairman Lord Stokes re-named it the Maxi. 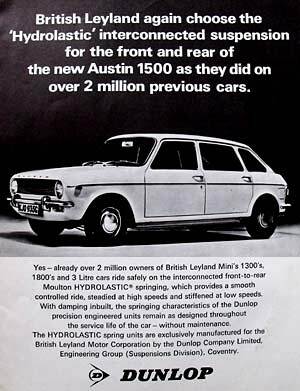 Confusingly, the many supplier advertisements to be found within the magazine's pages refer to the car using both model names - perhaps not surprisingly for British Leyland, a company rarely known for its attention to detail. Although the articles are many and varied in this issue, the reader is never but a page or two away from a reminder of the Maxi's imminent arrival in Austin-Morris dealerships. Suppliers were keen to bask in the glow of BL's new child. Concentric Pumps Ltd were proud to be the supplier of the Maxi's engine oil pump, while Dunlop was quick to point out that the Moulton Hydrolastic "spring" units were of their manufacture in Coventry. Advertisements for Champion, Girling, Triplex, Hardy Spicer, and Smiths Industries were also to be found, illustrated with photographs of pre-production Maxis. A six-page feature sees Austin-Morris Director of Engineering Charles Griffin answering questions about the new five-door, five-speed, OHC-engined hatchback, a specification that on paper reads as being bang up-to-date (for 1969), perfect to take on the best from Vauxhall, Ford, and the rest. Powering the Maxi was the new, E-Series engine, produced in a purpose-built facility at Cofton Hackett, adjacent to the main Longbridge works. When working at full capacity, it would be able to produce 5,000 engines and gearboxes per week. The detail that the article goes into with regard to the behind-the-scenes activities that led to the Maxi being launched, is considerable, and not something that any car producer today (or indeed prospective buyer of a car) would likely find in such a publication. Worth finding a copy, if you like ADO14s that is! Subsequent pages then discuss the finer points of the new Austin's specification in detail. Body colour options that would be available in 1969 read as follows: Snowberry White, Connaught Green, Blue Royale, El Pase Beige, Porcelain Green, Tartan Red, Cumulus Grey, and Fawn Brown. Despite all the excitement building for the new Austin, it's something of a relief to find interesting reminders that Triumph too - despite having nothing new to shout about at the time - was very much still on the scene, and producing some interesting cars into the bargain. Take the Triumph 2000 for instance, a comfy, long-legged six-cylinder cruiser, shown in Mk1 guise on page 15, having just arrived at an airstrip to collect the passengers of aircraft G-AVBN, a Piper PA28 Cherokee. Sadly this PA28 came a cropper in August 1970, when (according to the official AIB report) its pilot, suffering the after-effects of intoxicating liquor, crashed it into a field in Kent, with fatal results. Hopefully the Triumph ("The hush-hush car"), registration MHP 913G, led a less fraught existence. There's also a reminder of Standard-Triumph's tie-up with the - by comparison - tiny firm of Bond Cars Limited, of Preston in Lancashire. A full-page advert promotes the Bond Equipe Convertible, the GT Mk2, and the GT 4S, all of which featured Triumph running gear (and on the GT 4S modified Herald doors), clothed in Bond's own fibreglass bodywork, put together at their own factory yet sold via official S-T outlets. 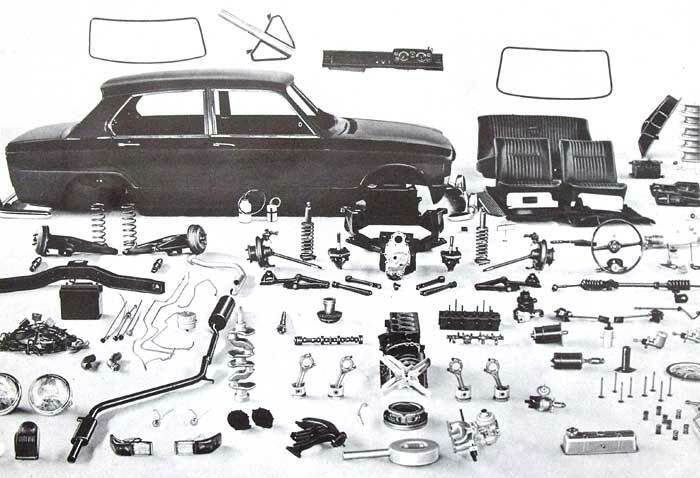 Page 53 presents a full-page advertisement promoting Stanpart spares for Triumphs. The reader's attention is drawn to a photograph of a dis-assembled Triumph 1300, a scene no doubt replicated on many occasions in later years, when enthusiasts for these well-appointed front-wheel-drive saloons took on the restoration of tired examples. A four-wheel-drive rallycross development of this model receives a brief mention in the magazine too, and is shown further down this page. Elsewhere in the magazine, a photo of a Herald 13/60 - with caravan - is used to illustrate an article that looks at the practicalities and considerations to be borne in mind when going on a caravanning holiday. Useful tips a-plenty are given, including a reminder that flashing indicators and hand signals are recommended when making a turn, and that the speed limit for caravanners on the motorway was, in 1969, just 40mph. Adjoining articles discuss towing limits and performance characteristics for all the then-current Triumph, and Rover, models. Interestingly, Standard-Triumph listed factory tow-bars for all-but-one of their models, owners of the TR6 would presumably have to make do with a tent instead, while TR4 and TR5 owners could opt to tow their holiday accommodation behind them (Stanpart number 14681). Fortunately not everything in this magazine is about new cars, or lifestyle pursuits, for on page 31 there's a full-colour photo of the following little gem - a very early "Bullnose" Morris, described as a 1017cc White and Poppe-engined Oxford. In all, 154,244 examples of the Bullnose were produced upto and including 1926. 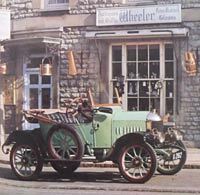 The two-seater, registration A 282, is shown parked outside Wheeler's antiques and gifts shop. Where is this Morris now? it doesn't show up on DVLA, assuming that is its real registration which it may not be, as the "A" series was used in 1904 and 1905 only, ie before this model was launched. Although BLMC would soon wind down much of its competition involvements, there are quite a few motorsport-related references to be found in this issue. There is, for instance, a multi-page article - penned by John Sprinzel - about rally legend Paddy Hopkirk, featuring photos of many of the cars he'd competed in by that time, many from the glory days of the BMC Competitions Department. The photographs are of a Standard Pennant, Triumph TR3As and, naturally, a variety of Minis. A potted history of saloon car racing fills three pages further on in High Road magazine, where photographs of many past greats are featured. These include a wild, much-modified, Mk1 Jaguar, driven by Michael Irving-Kerr (above). Once again, a number of pictures featuring "hot" Minis can also be found. The 4wd Triumph 1300 rallycross car. A single page article, titled "Comps Comment", is penned by Peter Browning, Manager of the BL Competitions Department. There is a single photo, but alas no description of, a Works-prepared four-wheel-drive Triumph 1300, being driven by Brian Culcheth at a snow-covered Lydden Hill rally cross meeting. This car was put together it seems at the home of Triumph's Competitions Department, at Canley, and featured a real hybrid of oily bits beneath its bodywork - including a Le-Mans specification Spitfire engine. Sadly the plug was pulled on the project before its potential had been fully exploited. What a shame it wasn't developed into a car eligible to take part in world-class rally events, years before the Quattro came along. While cars of the era are of limited interest to me personally, the content of this magazine is surprisingly interesting, and well worth the 75 pence it cost at a junkshop near Stockport many years ago :-) As far as I know, High Road magazine was only in print for a couple of years or so, therefore I don't expect to stumble across another copy in a junkshop any time soon.